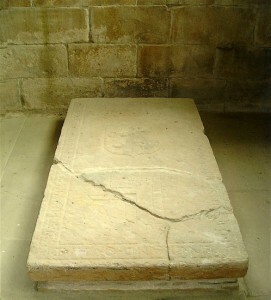 There are several graveslabs in Seaton Church. This one covered the grave of one of the Seaton family but which one could not be discerned on the day we visited. We shall locate a transcription of the wording and post it here as soon as possible. What attracted our attention to this stone was the masons’ tools carved into the lower portion of the slab. For a close-up of this part of the slab click here.